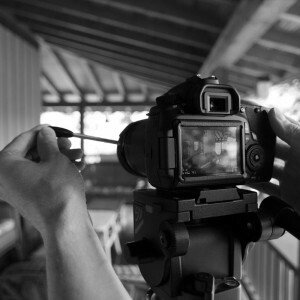 I personally feel that learning about all aspects of filmmaking is such an important part of being able to successfully navigate the complex details of shooting an independent film. I have been consuming a lot of storytelling information recently and stumbled into several resources that I think will benefit filmmakers, actors and directors immensely. All of the resources mentioned cost money (some more than others), but what could be better than being well prepared next time you embark on a project. FWIW, I can personally recommend all the resources featured below. 1. The first resource is from Michael Caine called “Acting in Film”. In this one hour DVD Mr. Caine gives you a once-in-a-lifetime chance to rob him blind! The man who’s hypnotized the camera lenses for a quarter of a century reveals the most closely guarded secrets on script preparation. working with the director, forming a character, voice, sound, and movement. Pearl by pearl he lays out the Caine wisdom on everything from set politics to set decorum, the film bureaucracy and more! 2. The next resource is from Uta Hagen called “Uta Hagen’s Acting Class: The DVDs”. Actors, directors, and teachers now have the opportunity to study with the legendary actress and teacher Uta Hagen for the first time on DVD. Shot over the course of two years, the interaction between Ms. Hagen and the actors and audience puts the viewer right in the room. All ten of her celebrated Object Exercises are clarified and performed. Jack Lemmon, Whoopi Goldberg and Christine Lahti, among others – all former students – recall their classes with Ms. Hagen and her enduring influence on their work. As Ms. Hagen herself states, “When I believe that there is a human being in action up there, in that moment, alive – right there – then I get spellbound. When you really achieve that understanding of human nature, the ability to place yourselves in the shoes of another human being and reveal that life onstage, is to me the ultimate experience.” 2 DVDS, 200 MINUTES TOTAL! 3. The next resource is a book by Jennifer Van Sijll called “Cinematic Storytelling: The 100 Most Powerful Film Conventions Every Filmmaker Must Know”. This book includes many visual framegrabs from some of the best films in history and breaks down the conventions that particular scenes or entire movies utilize for cinematic storytelling. The book also includes many script excerpts giving the reader a first hand look into some of the greatest screenplays ever written. The book covers everything from frame composition, editing, sounds effects, camera position, lenses, camera motion, and lighting just name a few. This is truly an enjoyable book and a resource that I will refer to again and again. 4. The next resource is over seven hours of actor training from the master himself called the “Sanford Meisner Master Class”. A comprehensive Master Class in acting taught by Sanford Meisner, this 8 hour instructional DVD set is the only existing video record of Meisner’s teaching. Essential viewing for film, TV and theater actors and directors, these DVDs also offer artists of all disciplines the opportunity to learn directly from a master who is now considered one of the most important acting theorists and teachers of the twentieth century. In 1980, a group of Meisner’s alumni recognized the importance of preserving his teachings for future generations. They banded together and filmed a Master Class with Sandy, short clips of which were used in the 1984 PBS special Sanford Meisner: Theater’s Best Kept Secret. Until now, the rest of the 28 hours of footage remained archived and unavailable. This DVD-set finally makes the footage from this class available to the general public; for the first time since his death in 1997, students can experience the Meisner Technique as taught by Meisner himself. Also available directly from the Meisner DVD website if amazon is out of stock. The Directing Motion Series with Vincent Laforet is hands down one of the most useful training series that I have ever purchased. Due to the cost, I agonized over whether to get it for quite a long time. Having watched the entire series three times now, I still find useful information which I did not absorb in the previous viewings. An expensive purchase, but I highly recommend it. If you are on a budget, the “Daytime Movement and Direction Workshop” is what I would recommend. One of the most important skills modern directors and DP’s are required to master is moving the camera in a dynamic and engaging way. 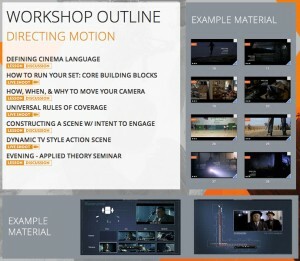 This workshop will teach all levels of filmmakers the precise cinematic language of motion, and how to move not only the camera itself, but also content in front of the camera. Video introduction to the workshop. I hope you found some of the resources useful. Until next time, stay focused!